This last weekend I was fortunate to host a gathering of the Nami ryu clan at the River of Life dojo. Please click on the link for a group photo. The training was phenomenal and an opportunity to practice freely taught principles and technique that are considered ‘secret’ by many other ryu. But those are subjects for another day. What I want to talk about are the deep bonds that have been forged over the years of training with this and the wider group that encompasses the ryu. We eat together and many share the mat in the dojo to sleep together for the duration. When someone wants to go to town, or to a restaurant, everybody joins in. When we bring in a new member everybody is welcoming and when we lose one, every one hurts. We had a couple of people who could only be here in spirit this year and they were missed by all. I’ve been in many martial arts classes where you hardly even knew the names of your practice partners. Where people can to share training, but not themselves. This is not a bad thing, its just not the same thing. I consider myself fortunate to have this group. When any one of us gets something in the lessons, it is shared by all. When someone has difficulty, everyone tries to help. The group grows and diminishes over time as new people come in and some people find that the challenges of life and family must take precedence. That’s ok. Someday they may be back and we’ll welcome them. In November a group of us will be spending a week with Kuroda sensei and his students, I’m looking forward to the training, of course, but also to the opportunity to live at the dojo there and travel with my friends. 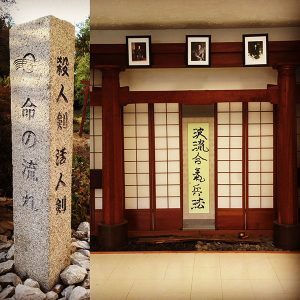 If you have an interest in being part of what is more than just a class, I encourage you to visit us at any of the Nami ryu dojo. I know you will be welcomed. You certainly are at River of Life dojo!